I’m rewatching the 2005 anime series as it’s slowly released on DVD, volume by volume, in the US. I previewed the series here. The packaging is impressive, with artwork postcards and detailed, illustrated booklets inside. The aspect ratio is correct at 16:9 anamorphic. I’d even be tempted if this was released HD, and I’d eventually hope for an update on the albeit lush stereo mix (the original Japanese release is listed on CDjapan as stereo there too), but I’d hope for a future 5.1 remix. Triple-dipping... it's gonna happen sometime. I've also just discovered a medium-format book of artwork, production sketches, including a well-illustrated episode guide. Available here on the Anime Artworks eBay store. Of course, the book is all in Japanese, but the high quality layouts are rewarding enough. The anime episodes are eminently rewatchable, beautiful to look at, full of mood and colour and music, detailed animation, delicately constructed stories full of twists surprises, with occasional shocks and creep-outs. The very first episode is uncharacteristic, trying to show the full range of what mushi can be, showing them as everything from energy to human in form. Some of these complicated mushi apparitions don’t reoccur in the series and it's far from a typical episode. 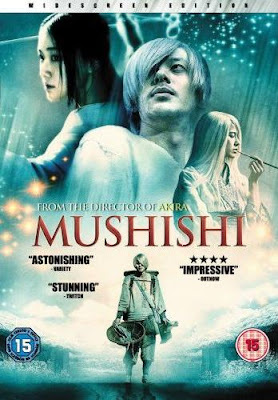 After the first one, I still wasn't entirely sure what mushi typically looked like. 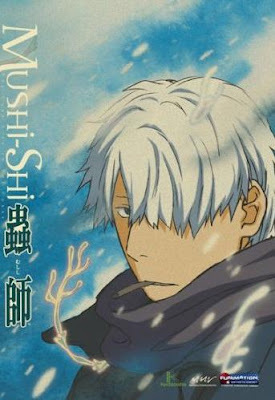 The second introduces the format of what usually happens - with a problem introduced, Ginko sensing/summoned to the problem, then tackling the mushi. Alternately spectacular, horrific, funny and beautiful. It's a difficult series to label. Loving the series so much, I approached the live-action version rather warily. It reworks incidents from 4 or 5 stories. 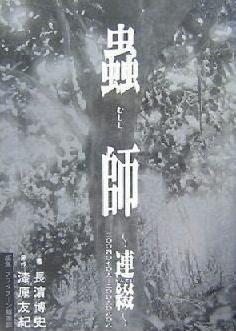 Even though new manga stories are still being produced, the movie uses events that have already been visualised in the anime. After a gripping opening, the story meanders between fairly unconnected events, occasionally matching the enchanting visuals of the anime, but usually telling the same stories less magically. The other strength of the series is the music, but the movie uses very little. There’s a strong central performance from Joe Odagiri (Shinobi), even though his hairstyle looks more like Gegege No Kitarou rather than the spikier one in the manga. 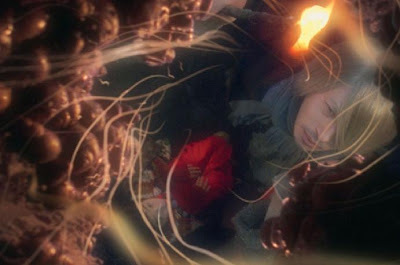 The visual Fx often makes the mushi look more like smoke or liquid rather than creatures. Some mystified critics who are taking the film at face value, are mistaking them for a kind of plague, rather than a part of the fabric of life. It’s almost impossible for lightning to strike twice for both the anime and live-action adaptions. I think it’s interesting to see the stories acted out, but only of interest to fans of the anime. Followers of the director, Katsuhiro Otomo (Akira, Steamboy) may have their expectations set way too high if they are expecting a dazzling epic.. Ideally it will intrigue moviegoers to sample the anime, but if they don’t enjoy it, they may be put off one of the best anime series of the decade. 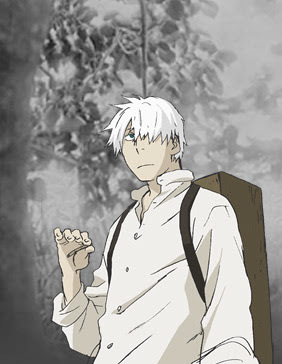 Mushishi - the movie gets a UK release in February (note that the original western title of Bugmaster has been dropped in order to tie in with the anime and manga releases that are already underway).